I can't believe it's November already! We had a wonderful October as we took our boy trick-or-treating for the first time. It was so much fun! We have since moved to Ohio, but we haven't yet moved into our house. Preemptively, we trick-or-treated around the new neighborhood where we will be living very soon I hope. We met a bunch of the neighbors, and we got candy, of course. It was awesome! On that note, the craft for this time was Joey's costume. 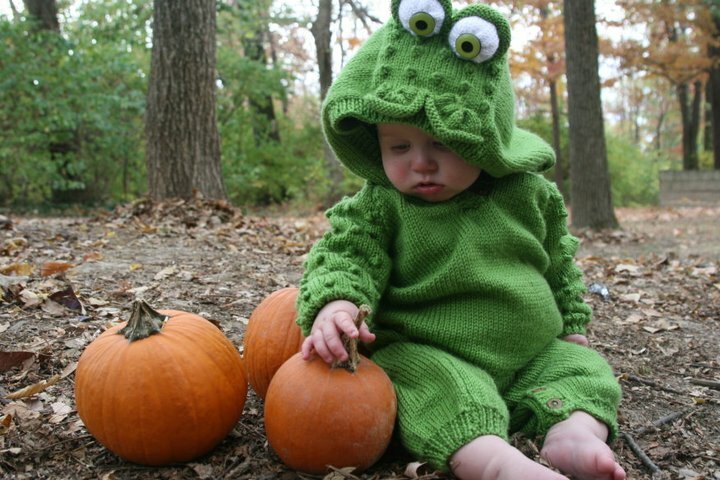 I knit him the cutest little frog costume. I, personally, thought it was genius. :) Plus, none of the other kids had the same costume. I got this pattern from a book called Wacky Baby Knits, and, despite all the problems other people had with it, I had a great time knitting it. When it comes to knitting, I just trust the pattern. Even if it doesn't make sense to me at the time, I always just do what it tells me. It always turns out. :) I wish everything worked out that way! There were a couple times I had to check the ravelry forum to see what other people thought of the pattern, but then I just went for it. Sure, I'll make the frog eyes just like I made the frog eyelids. It doesn't make any sense, but I'll figure it out. I'm usually one to make it up as I go, anyway. Everything turned out fine, as you can see. The pattern was free, by the way. I'm sure you can google Wacky Baby Knits along with frog or you can just go straight to ravelry (if you have an account) and look it up there. Ravelry is definitely my go-to place for patterns. Google is kind of a waste of time that way. Scott also had a hand in this, and I always value his design opinion, but he really helped with this one. The pattern had me stitching the black part of the eyes. We went button shopping for all the buttons to close up the legs and the collar, and Scott found the coolest green froggy eyes! They match the yarn perfectly, and they really just made the outfit. So, thank you, baby. :) Your input was invaluable.